Some extensions come under permitted development & do not require planning permission, provided various conditions are met. 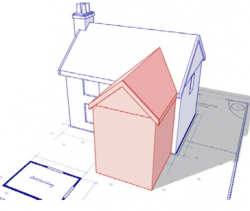 Extensions – some extensions are now considered to be permitted development, and do not require planning permission, provided certain limits and conditions are met. 1. On “designated land”* cladding of any part of the exterior of a dwelling (and extensions) with stone, artificial stone, pebble dash, render, timber, plastic or tiles is not permitted development. 2. Extensions (including previous extensions) and other buildings must not exceed 50% of the total area of land around the “original house”*. 4. On designated land side extensions are not permitted development. On designated land and Sites of Special Interest the regime for larger single-storey rear extensions (see point 9) that runs until 30 May 2019 does NOT apply. 6. Width of side extension must not have a width greater than half the width of the original house. 7. Side extensions to be single storey with a maximum height of four metres. 8. If extension is within two metres of a boundary, maximum eaves height should be no higher than three metres to be permitted development. 9Single storey rear extension must not extend beyond the rear of the original house by more than 3 metres of an attached house or by 4 metres of a detached house. 10. Single storey rear extension must not exceed a height of 4 metres. 11. Maximum eaves and ridge height of extension no higher than existing house. IMPORTANT NOTE: The permitted development allowances described here apply to houses, not flats, maisonettes or other buildings. Check with you Local Planning Authority whether permitted development rights apply—they may have been removed by what are known as Article 4 directions. Other consents maybe required if your house is listed or in a designated area. WALES: This guidance relates to the planning regime for England. Policy in Wales may differ. 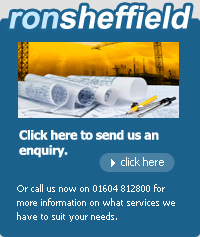 Installation, alteration or replacement of a chimney, flue or soil or vent pipes. Guidance on the Planning Portal Permitted Development Regime under class G.
DISCLAIMER: Readers please note this is an introductory guide and not a definitive source of legal information. “ Designated land”—includes national parks, the Broads, Areas of Outstanding Natural Beauty, conservation areas and World Heritage Sites. Two-storey extension (extensions of more than one storey). 1. On “designated land”* extensions of more than one storey are not permitted development. 3. Maximum eaves and ridge height of extension no higher than existing house. 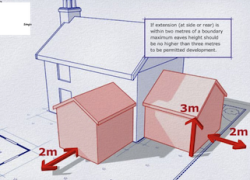 If extension is within 2 metres of a boundary maximum eaves height should be no higher than 3 metres to be permitted development. 4. Extensions of more than one storey must not extend beyond the rear wall of original house or be within 7 metres of any boundary opposite the rear wall of the house. 5. Roof pitch of extensions higher than one storey to match that of the existing house as far as is practicable. 6. Material used in exterior work to be similar in appearance to those of the exterior of the existing house. 7. Any upper-floor window in a wall or roof slope in a side elevation must be obscure-glazed and non-opening unless the parts, which can be opened, are more than 1.7 metres above the floor of the room in which it is installed. 8. No balconies or verandas are permitted development.